CjB Productions: You'll just have to WAIT! You'll just have to WAIT! I know I promised the Green Lantern Spread I have been working on, but I changed my mind, and I don't want to post it just yet. I'm really proud of how it came out, and the finished piece; that I wanted to hold off on revealing it just yet. I want to show it to a few people around the office, see what they think. Not that I expect anything to happen with it, although I think it would make a KICK A$$ poster, I decided to hold off for just a bit longer. Maybe I can get some professional inker and/ or colorist to make it look really killer, you know. I'll see what I can come up with! So, just because I felt bad that I wouldn't be able to post it today, I decided to do a drawing to hold everyone over! I'll build up the anticipation for the 60 Green Lanterns vs. Sinestro drawing just a tad longer, make people wait it out. People want what they can't have, so the long I don't show them, the more they'll want to see it. HA HAH Just Kidding! 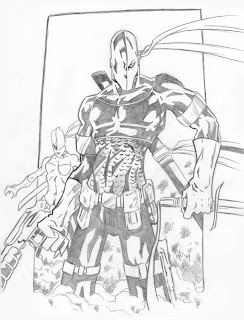 Til then... enjoy this Deathstroke and Ravenger pin-up for the time being. Just did this up quick yesterday, but I really liked how it turned out! JLA Cards Coming in SUMMER '09! Re-enter the House of Mystery! Please Make a Good GI Joe Movie! PLEASE? !